Musings on "the most democratic of instruments"
Last week I had a very interesting experience. A friend had sent me a link to a marketing project from Mirvish Productions in Toronto. They were looking for 100 guitarists to go to Mirvish Theatre and play the song “Falling Slowly” from the musical “Once”. We both signed up. When we got our confirmation e-mail they indicated that about 500 guitarists had signed up. Three of us headed into Toronto on the appointed day and, from the moment that we parked, I had a feeling that this was going to be something special. Almost everyone in the parking lot was unloading a guitar and as we walked around the block to the entrance it seemed that every other person was carrying a guitar. We joined the line outside of the theatre and before long we were inside collecting the promised pairs of tickets to the actual show. The event seemed very well organized, with people directing traffic at regular intervals. We were assigned our seats and marveled at the variety of both people and guitars that had come out. Of course there were some there that were hoping to get “discovered” and others who ducked every time a camera went past – because the excuse they gave at work didn’t involve playing guitar. Some were experienced players and others were fairly new to the instrument and even a bit nervous despite the relative anonymity of playing in such a large group. We also ran into 4 other guitarists from our little town of Uxbridge – turns out there were others there too. A number of the cast came on stage and gave us some instruction as to how the song would go and then we played three “takes”. I was pleasantly surprised by how good it sounded! They announced that the three takes were sufficient and within half an hour of starting, we were enjoying lunch at Fran’s Restaurant. At the end of it all, they announced that 926 guitarists had taken part! Certainly the largest group I’ve ever played in – and the tickets they gave us were pretty decent too. Tags: "100 Guitars", "Falling Slowly", "Once"
In one of my very first blog posts, over 4 years ago, I talked about my commitment to performing more often. 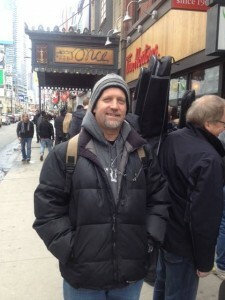 Since then, I have performed as an instrumental soloist fairly regularly at 3 different open mics; I have performed at an adjudicated festival 3 times; and I have played at a street festival at least three times. And while I can’t claim to be an expert I have gained some insight into combating stage-fright and getting the best possible musical performance. The first, and most obvious, one is “practice, practice, practice.” I won’t spend a lot of time on this, except to say that, among other things, you should do your best to mimic “show conditions” when preparing for public performance. The second, which took me a while to figure out even though it should be obvious, is “get plenty of rest”. It is no co-incidence that car accidents rise dramatically when we lose an hour of sleep to daylight savings time and drop dramatically when we get that hour of sleep back. We function better when we’ve had a good night’s sleep. The third, and for me this was the real revelation, is “ignore the audience.” I have always been told that you need to engage your audience, and this is true, but you don’t need to pay attention to them. For a while, I believed that engaging your audience meant making eye contact – which almost always resulted in mistakes of one form or another. I started paying attention to performers that I liked and noticed that most don’t look at the audience much, if at all, when performing. Many actually close their eyes or spend much of their time looking at their instrument – and yet, as an audience member, I was engaged! These performers did not draw me in by interacting with me… They drew me in by interacting with the music that they were playing! This revelation has had a profound influence on my performances and preparation. For me, this has meant that I have had to start working on playing standing up. For the instrumental music that I like to play, I have found that I can more effectively use my body language to reflect the music that I am playing while standing up. The irony of this is that, from a technical standpoint, I can’t play as well while standing, but I’m convinced that, overall, it yields a better performance. Now I wish I could say that I have suddenly become a standout performer, or even that I no longer battle stage-fright – neither is true. But I do believe that I have taken a major step on the way to becoming a better musician! 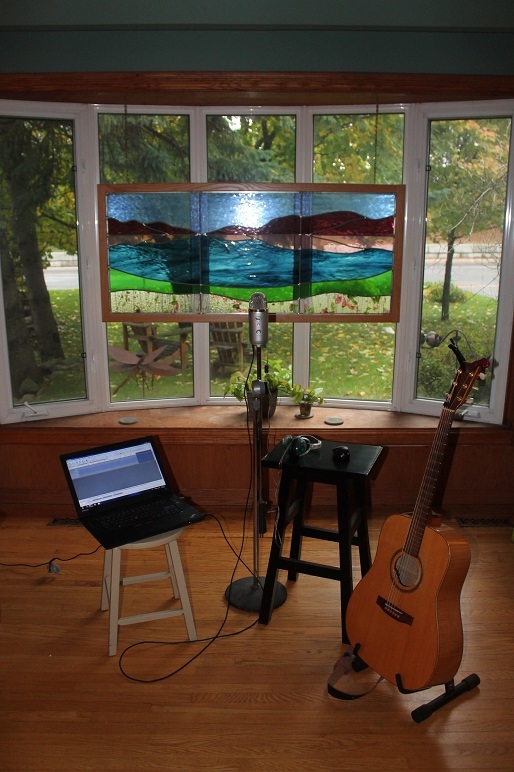 Today I took another crack at recording Echoing Wilderness, this time at a faster tempo – though still not near as fast as Gilewitz’s original. … so the first take (a decent performance) was a write-off. The first track that I am going to record is Richard Gilewitz’s “Echoing Wilderness”. I’ll be playing the abridged version, similar to the one that Leo Kottke recorded, rather than the much longer original. I timed out “Echoing Wilderness” at about three and a half minutes, so I created a three and a half minute click track [Generate>Click Track] at 72 beats per minute (bpm), which I figured to be about the right tempo. At 72 beats per minute, the song is longer than three and a half minutes. I was still playing the outro when the click track stopped. “Perfect!” I thought, since a wanted to slow down at the end anyways. What I didn’t realize was that when the click track stopped, the recording stopped, so I didn’t actually record the last bit of the tune. This time, I created a 4:30 long click track at 76 bpm and then “silenced” the last minute [select the last minute of the track, Generate>Silence] to allow for slowing down in the outro. I wasn’t able to get a clean recording with my remaining time and 76 bpm is possibly still a bit slow, but I did get a guitar track that I could play with a bit to see how I could manipulate the recording with Audacity. I played around with adding reverb and experimented with other techniques for “fattening up” the sound. It’s interesting how much a tune can change over the years from the time you learn it, if you never refer back to the original. People tell me that the word “album” is out-dated. So its the word I’m going to use. I’ve decided to record an album. Not one that you are ever likely to be able to buy, but one that I will record simply for the experience of it. I’ve decided that it will be a collection of instrumental guitar tunes that were inspired by nature. It will be a short album – perhaps, half a dozen songs, written by some of my favourite guitarists/composers. I have a Blue Yeti USB microphone, given to me a couple of Christmases ago, and a cheap refurbished laptop that I recently purchased. I’ve loaded Audacity (free, open-source recording software) onto my computer and I’m ready to go! I expect that this experience will teach me a lot – and you may be able to learn from my failures! It’s been a while since I’ve posted anything here. In many ways that’s a good thing. As my teaching and playing schedule has filled in (not to mention a busier family life), I’ve had less time for writing – though no shortage of things to write about. Without making any promises, I am hoping to carve out some time for writing again. Two years ago I was starting to get a decent amount of traffic visiting my blog – so to those of you who were following along, I apologize. And I hope you’ll check in from time to time. In a bold departure from my usual video-of-the-month, this month’s video features a new product that is hitting the market today. If even a fraction of the hype is true, this should take the guitar playing market by storm. As always, I have absolutely no affiliation with the product in question. November’s Video-of-the-Month features a tune that I have just started working on. I started guitar lessons a month ago (after not having formal lessons for over 30 years) and this is the second tune that my teacher gave me to work on. It’s a tough one! The thing that I like about this piece is that it is forcing me to use voicings that I would not typically use on my own. It also has some very cool counterpoint (bits that complement the melody and harmony). Here is Stephen Kenyon playing his interpretation of the tune, which differs from the version that I am learning in the way that he approaches the grace notes. If you would like to learn the piece, here is a free transcription. This month’s Video-of-the-Month is one that gives me hope for my future. While he is certainly not at his best in this video, his lifetime of virtuosity is in full view. As I understand it, he suffered from severe arthritis in his hands by this point in his career, and yet he was still able to keep his audiences enthralled. I just hope that if I live that long, I’ll still be able to play for my own enjoyment – let alone someone else’s! Nope, that is not an advisory for the content of this post, it is the name of the band I’m in that is playing it’s first gig this Saturday. We’re a five piece band made up of parents from my kid’s school – hence the name. 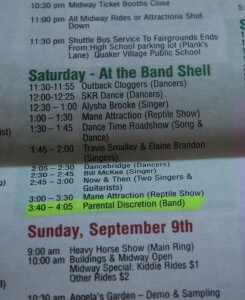 If you’re at the Uxbridge Fall Fair this Saturday, drop by the bandshell at 3:45 – we’ll be playing a 50 minute set. I’ll be the one playing bass.